Cowboy Up! Come on down to the Triple “G” Hideaway Restaurant. 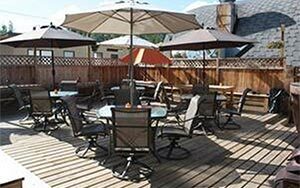 We have a fully licensed family restaurant with lounge and patio (patio open in the summer months). Open for breakfast lunch and dinner. We offer an outdoor BBQ for steak nights and burger lunches. Saddle up at the bar or relax at a table in the western inspired restaurant. Open Seasonally during summer months only.